Just a brief little postette of a walk that any regular readers of mine will know well now. 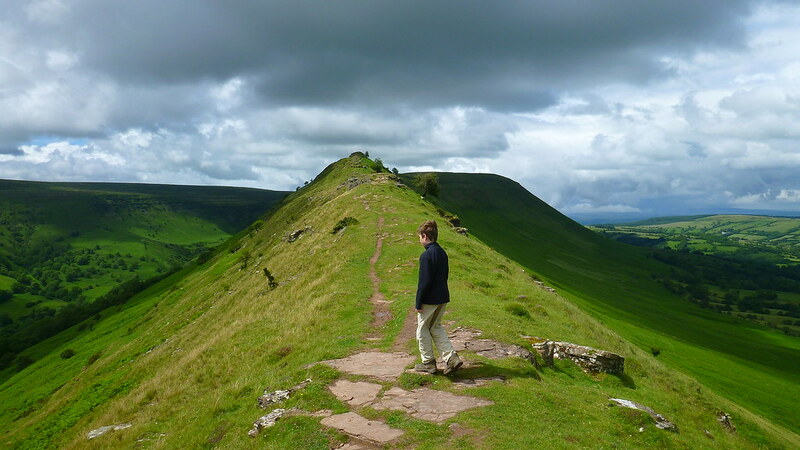 The ridge of the Cats Back up to Black Hill doubles as the best and narrowest ridge in the Black Mountains and also the closest point of access to the hills to my home. 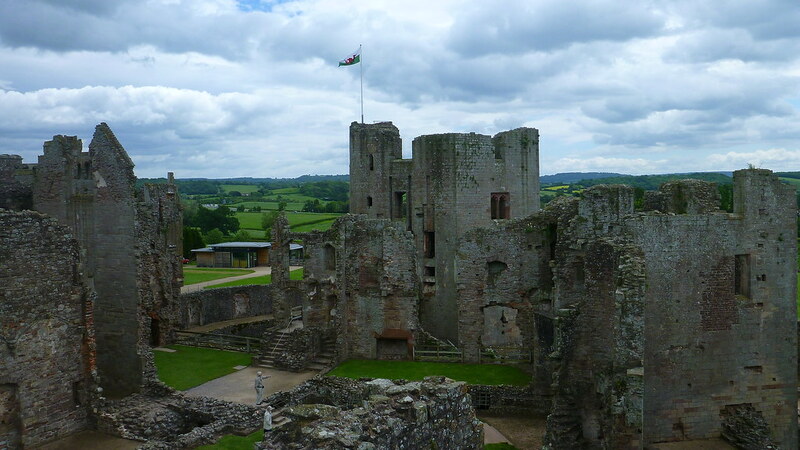 I’ve been up here numerous times since I relocated to Herefordshire in 2002 and you can read about a summer trip last year and new year visit earlier this year for the full details. 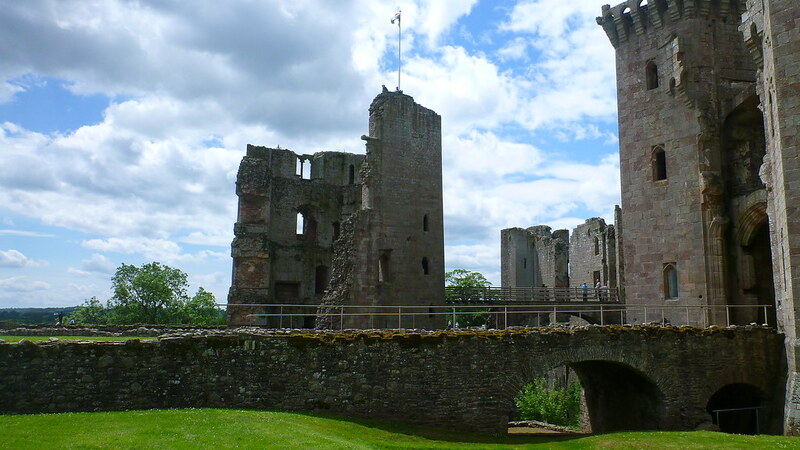 This trip was a quick jaunt on a day of heavy showers with just me Jane and D while L was away on a Brownie trip to Warwick Castle. 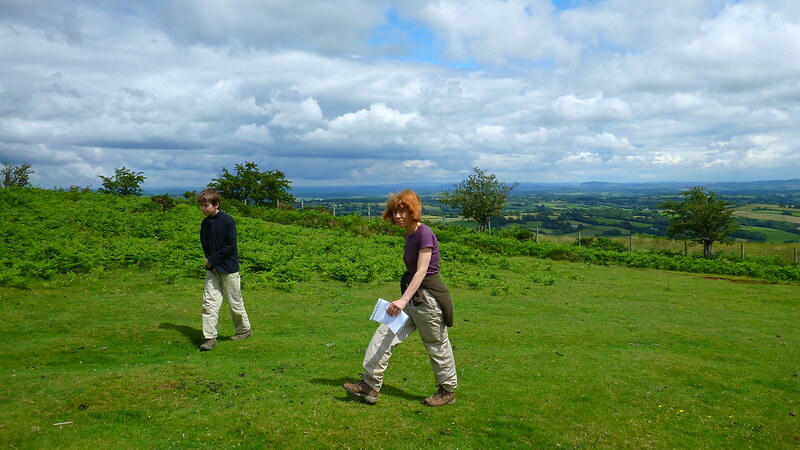 Jane is a supply teacher and has been taking a topic on the mountain environment at a local school for the last couple of terms. 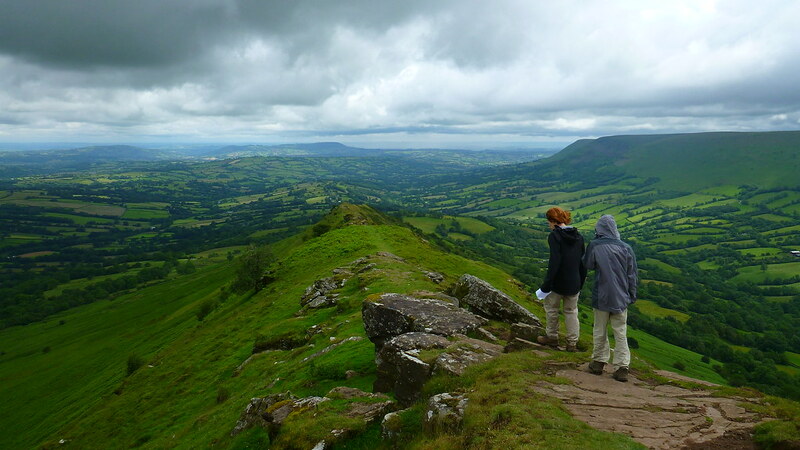 Part of this was a day trip to said mountain environment and I suggested the Cats Back and Black Hill as you start high and it’s a very easy walk to reach a significant point. 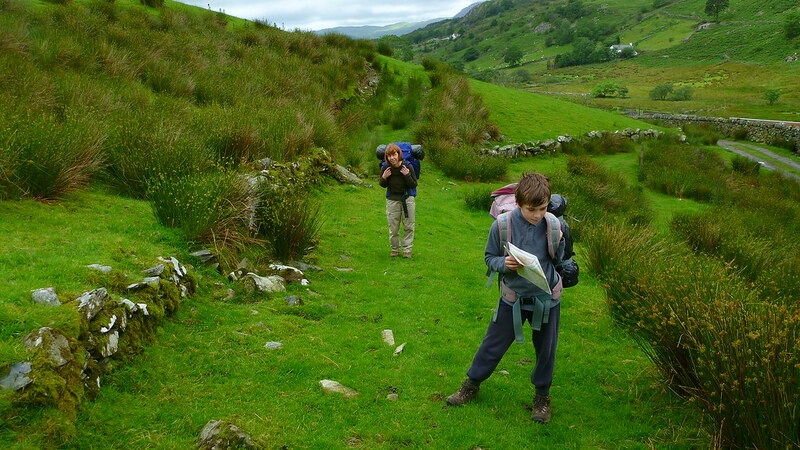 For a few years now I’ve been promising to take my son D backpacking with me. 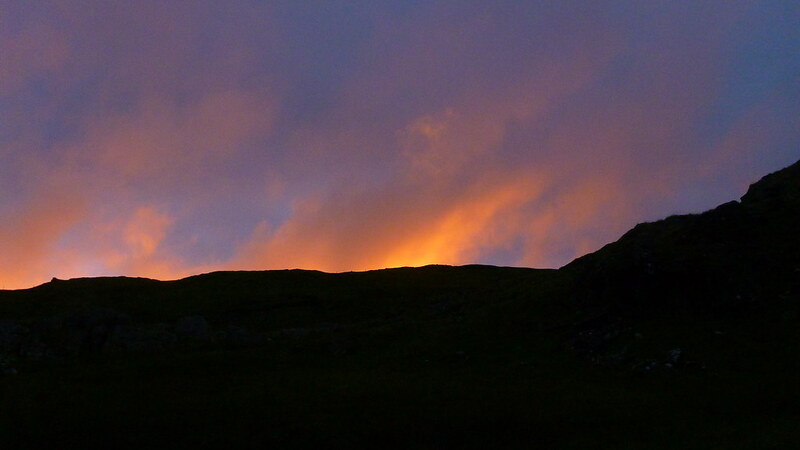 The right opportunity hadn’t really presented itself and more importantly I hadn’t yet found a decent camp site. I wanted somewhere with a good situation, fresh running water and not too far from the road as I’d have to carry most of the weight. I know several spots that fit the bill in the Lakes and Scotland but my local hills in South Wales aren’t quite so conducive with a little more effort required to find a good spot. My recent re-introductions to the majesty of North Wales haf however highlighted a whole collection of new possibilities. This was especially true of a recent day spent on the Moelwyns and Cnicht, a vast backpackers playground of rocky knolls, small tarns and streams. 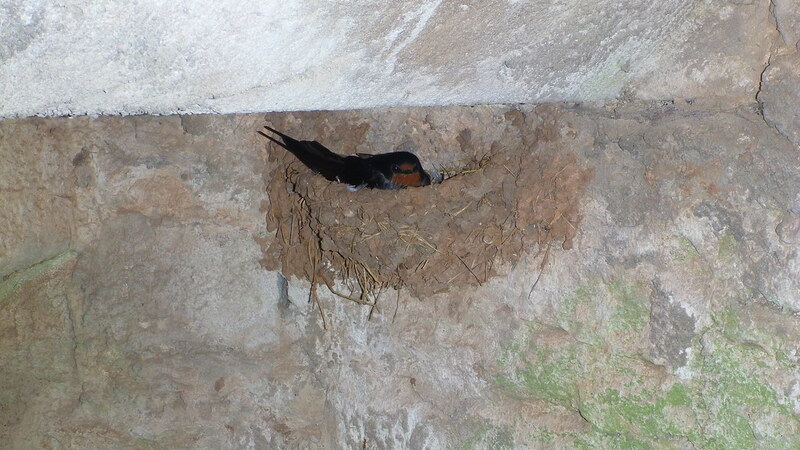 I spotted numerous great sites and so we decided finally we needed to give it a whirl. 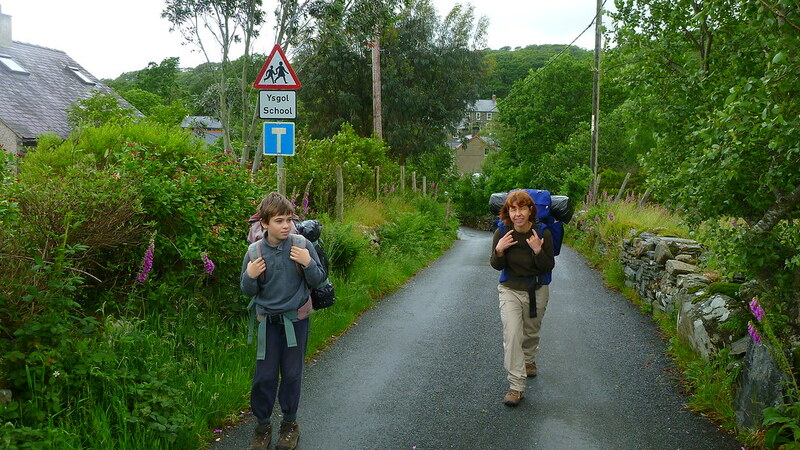 L, my youngest, wasn’t keen to join us so we had to pick a weekend where we could leave her in the capable care of my parents at their mid-Wales caravan. This meant we had to just take a chance on the weather which as we planned the trip didn’t look to promising. We stayed overnight on the Friday at the caravan after driving from Hereford under gloomy skies and drizzle. The Saturday morning wasn’t much better but the forecast whilst not great could have been a lot worse. 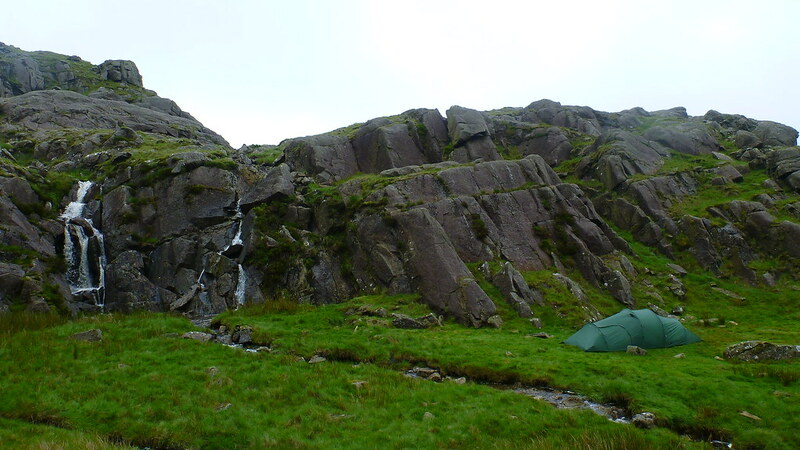 We decided that as we may as well just go for it as I’d seen some sites not too far so at least a night spent in the wilds would be fun even if we didn’t get to climb anything. Jane came along too which made the weight carrying much easier. D carried his own sleeping bag, mat. clothes and food so me and Jane just split the rest which meant we weren’t really carrying much more than if we’d been on our own. 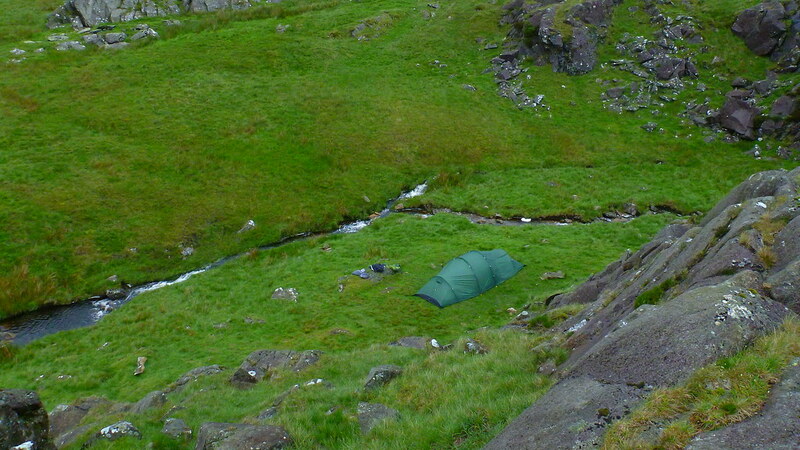 I’ve gone to Scotland once a year for some wild camping so I’m used to the heavy pack. Jane hasn’t been for years and was a bit apprehensive but in the end she was totally fine and not too far behind me most of the two days. We drove up through Snowdonia in a mixture of sunshine and heavy showers. 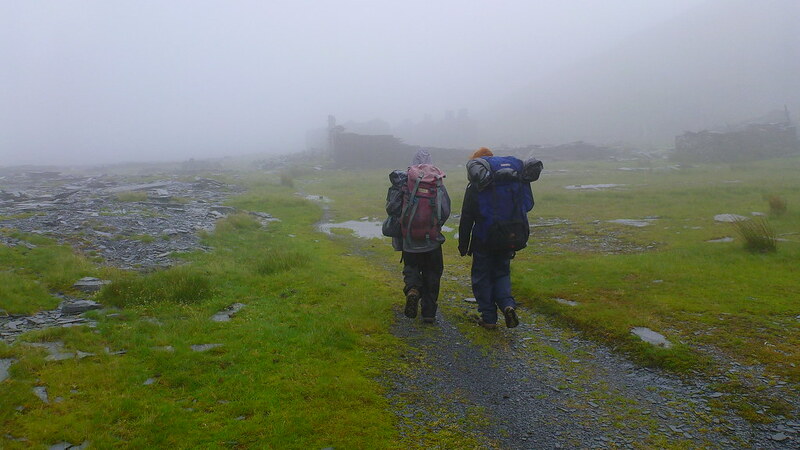 When we arrived in Croesor it had clearly just finished tipping it down and the small car park was nearly empty. 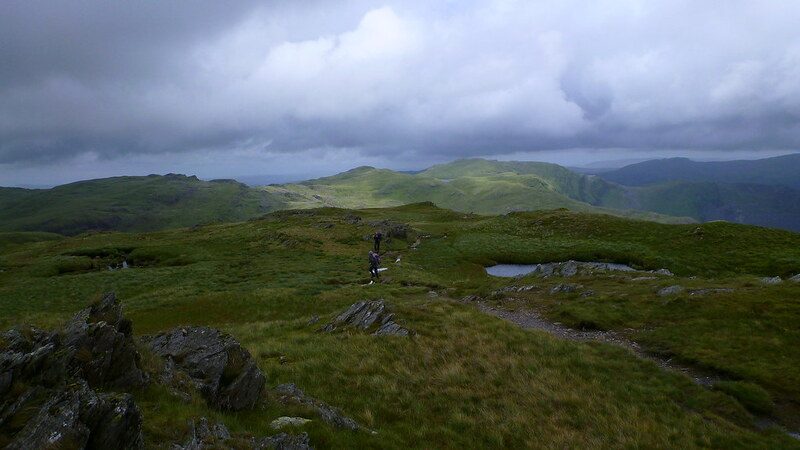 We made the final preparations and chatted with a friendly couple planning on doing Cnicht. When I mentioned we were camping wild her face dropped with an “Oh!” that said “are you mad”. Made us smile as we headed off into the wilds. D was really excited by the prospect and had been looking forward to the trip for weeks. 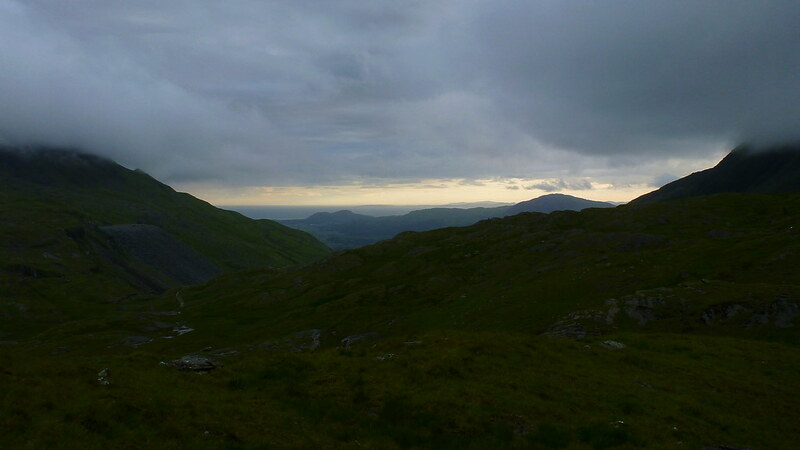 It was such a shame the weather was so dark and brooding but I hoped that the wild weather might provide some extra excitement to replace the idealistic vision I had of sitting on a warm summit watching the sun go down. We took one of the gentle rising paths along Cwm Croesor towards Bwlch y Rhosydd as I thought this would be an easy way to gain the height. It was a great choice and really nice grassy path the reached high into the wild and deserted old mine workings that dominate this part of Wales. D was enjoying the challenge but clearly not used to carrying a pack but soldiered under my tutelage with the words “this is what backpacking is all about ringing in his ears. The path suddenly climbs the last steep section with a spattering of heavy rain and spray from the wild wind giving the place a serious air even though we were barely 1500 feet up. 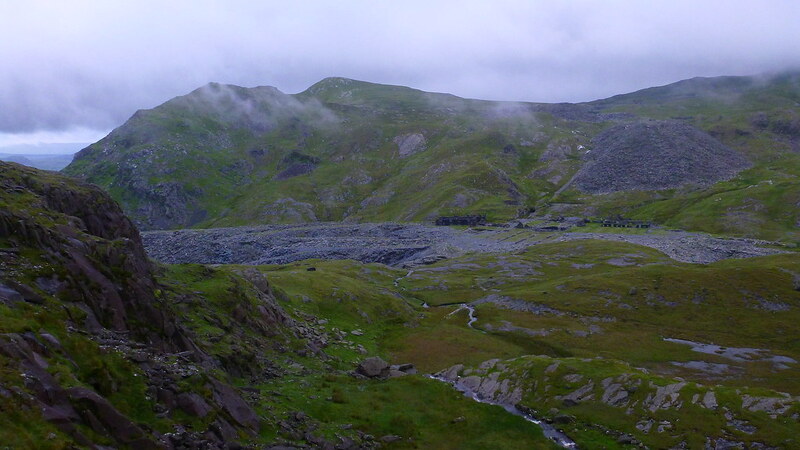 We picked a disused quarry tramway that took us into the heart of the vast deserted collection of old mine workings. By now were enveloped in the cloud which gave the whole area a spooky and ethereal air. What was a problem was the fact that visibility was about 20 feet which I wasn’t expecting. 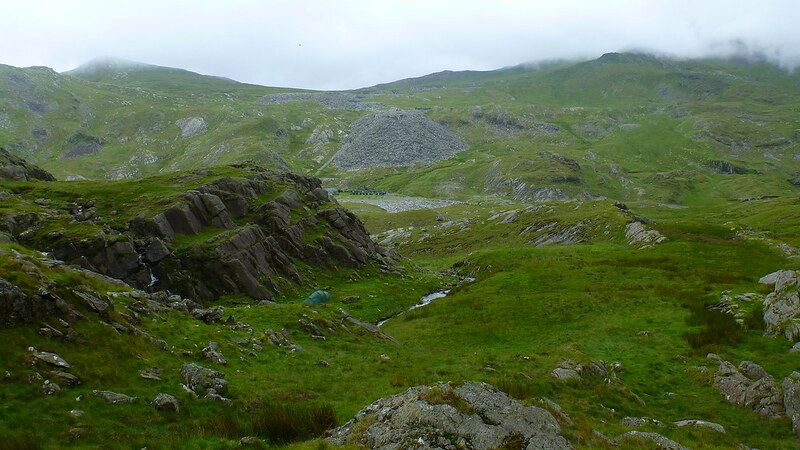 Clearly we couldn’t camp up near the summits as I’d planned but I’d spotted a cracking flat site on the previous visit next to the river that flows into Rhosydd quarries from the north. Finding the spot would be easy even in the mist by following the river. Finding a dry route through the boggy wasteland was not so easy. A few minutes were spent wandering aimlessly through the swamps before at a random spot I headed across the grass and there was my little spot waiting for us. We were still in the cloud so we quickly unpacked and put the tent up, a Lightwave T30 Trek XT for the gear freaks amongst you. A great purchase that comfortably sleeps 3 with a huge porch for gear storage and for its size relatively light. 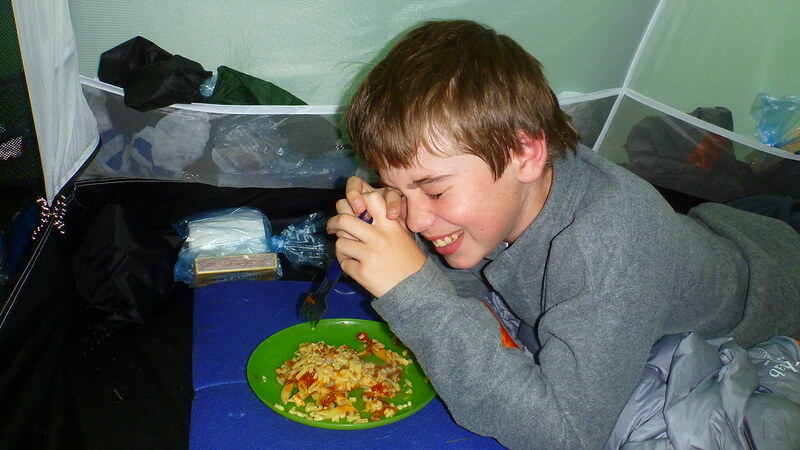 We dived in a settled in and introduced D to that great feeling of pitching up in wild weather and then relaxing in a warm dry tent. He really seemed to be enjoying the experience although I was a little disappointed that we couldn’t sit outside and enjoy this terrific little pitch next to a small waterfall. I’d had a worry that this might be a popular spot and been taken already but in weather like this we’d barely seen a soul all day. It would be a superb spot in the sunshine with loads of rocks to scramble on and ledges to perch on. We took a very extended lunch waiting for a break in the weather before heading out for a stroll. 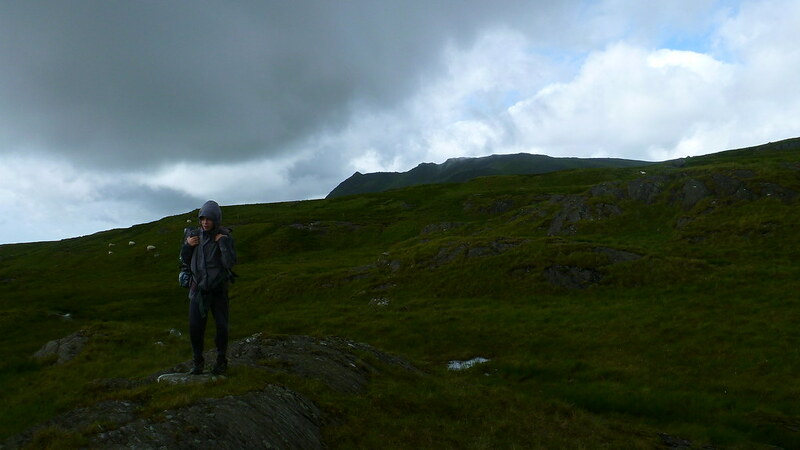 The cloud lifted a little so we took a little wander around the local lakes and rocky summits that fill this wild upland area. 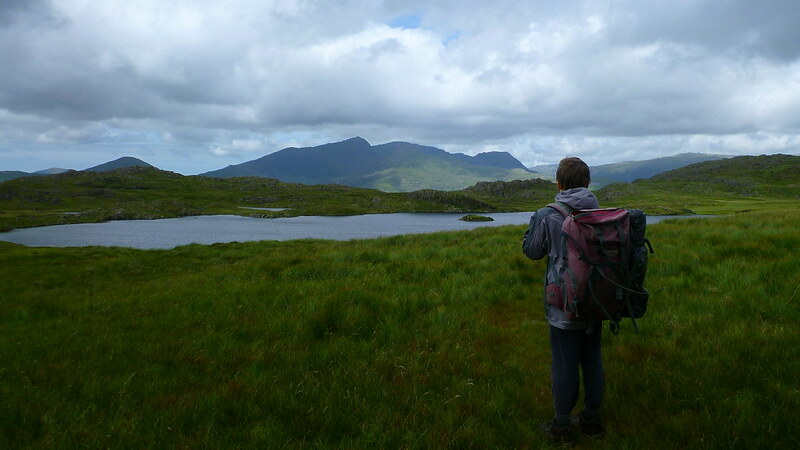 No surprise that an area populated by lakes is a trifle boggy, especially after the recent wet weather, every footstep seemed soggy as we squelched up to Llyn Cwm Corsiog, and on to little Llyn Terfyn. Whilst not exactly sunny the cloud had lifted and we enjoyed being out in the late afternoon with the whole area to ourselves. 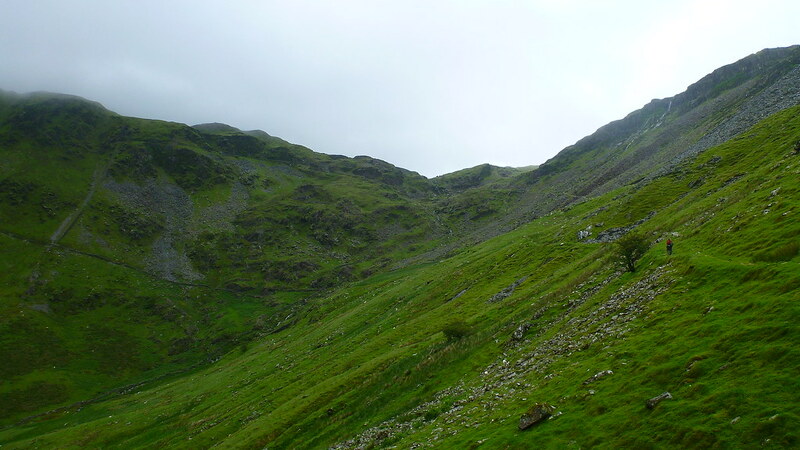 The walk along the low rocky ridge to Llyn Yr Adar is one of my favourites in the UK and I couldn’t help thinking what a marvellous spot for a wild camp it would be in better weather. 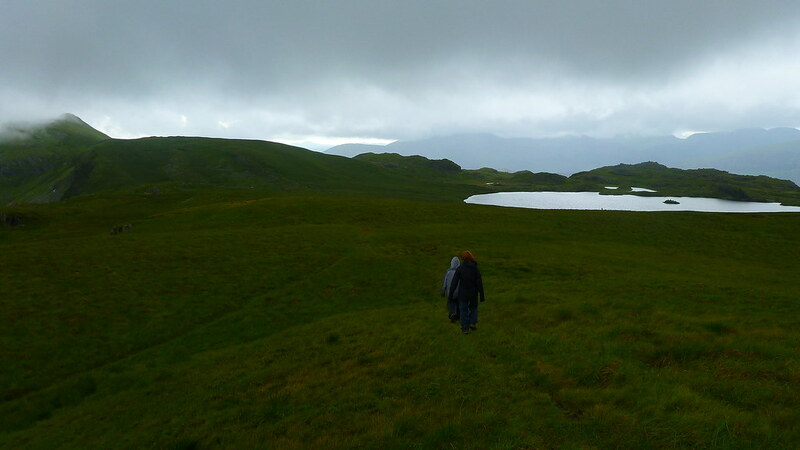 As we returned towards the tent for tea I got a little confused between which lake was which involving us in a little detour across some exceptionally boggy ground. Still it only added a few minutes to the return the trip and that’s not really a problem is it? Unless of course you’re within sight of the tent the heavens open. What felt like a wall of water descended on us while we scrambled back into the tent. I foolishly decided to fill the water bottles and pans for the evening during which time the rain came down ever harder. I was absolutely soaked. Looked like the outdoor activity for the day was over. 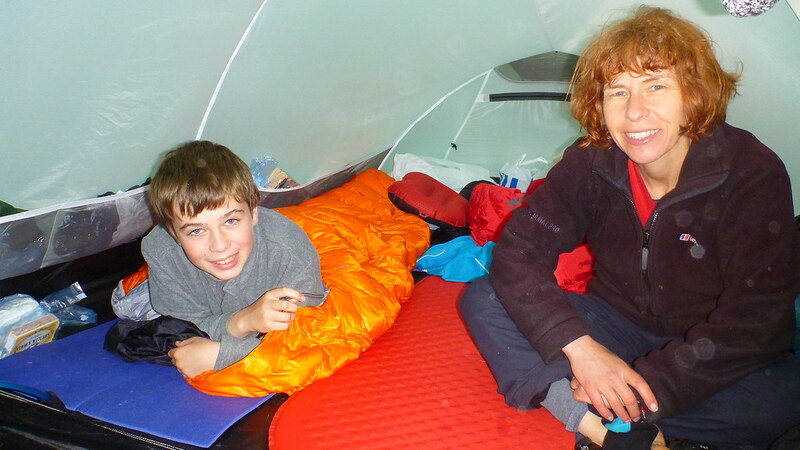 We settled in for our tea again enjoying that cosy feeling of warm tent with the rain battering on the roof. After a hearty meal we relaxed and asked several rounds of quiz questions from a couple of books we’d downloaded to Jane’s Kindle, a great way to pass a sociable and fun couple of hours. With light fading I went out for a wander in just my flip-flops. 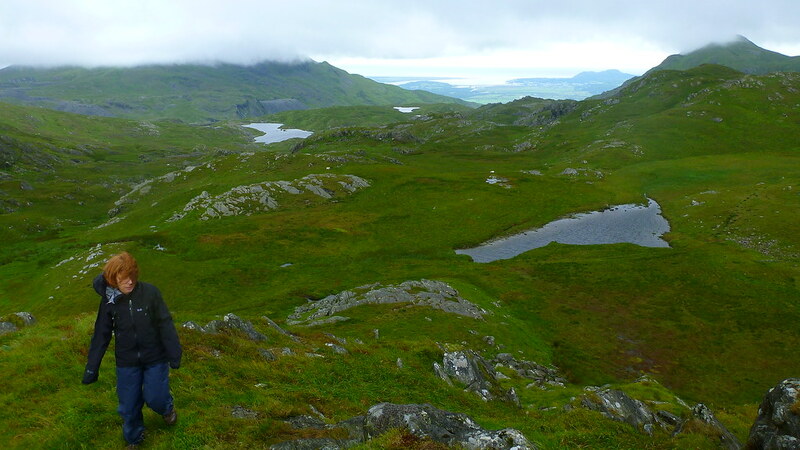 I scrambled up the rocks above the tent (no mean feat in flip-flops) to little Llyn Clogwyn Brith and the weather brightened and cleared quite a bit. I spent a few minutes trying hop from tussock to rock to avoid wetting my feet before realising it was much easier to paddle through the bog. It wasn’t as cold as I thought on the feet so I just padded about in the fading light. Magnificent. The forecast promised a better day on Sunday and when Jane answered the call of nature in the night the sky was clear. By morning it was raining again so we lazed in and were surprised to find that when we stirred again it was 9:30! Time for a breakfast. Regular readers will be aware of my search for a suitable breakfast for backpacking. After much experimentation I’ve now settled on what I think is the perfect solution. Bacon Sandwiches! (Thanks to Pete over at writesofway for pointing out the obvious). 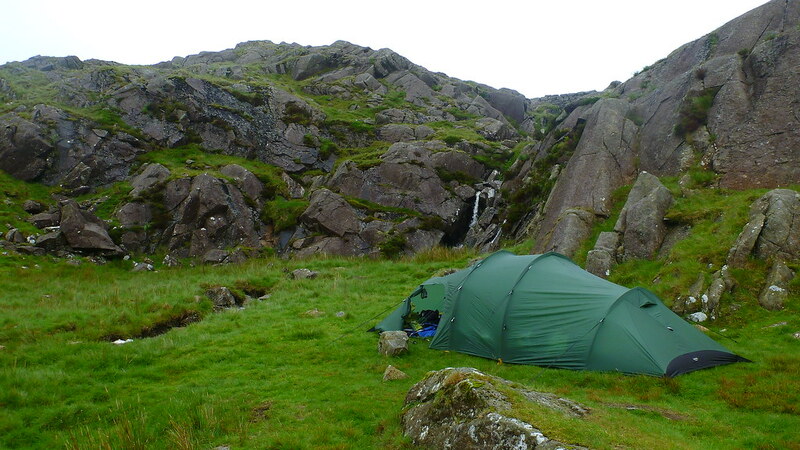 We were in the cloud and rain, a thoroughly miserable day but what could be finer than lazing in a tent on a Sunday morning with a fresh cuppa and a bacon butty – marvellous. We hung around in the tent for a couple of hours and eventually decided that if we were going to get anything out of the day we may as well pack up and get moving. It was 12:00 by the time we were ready but it had given time for the cloud to lift and it was a half reasonable afternoon. 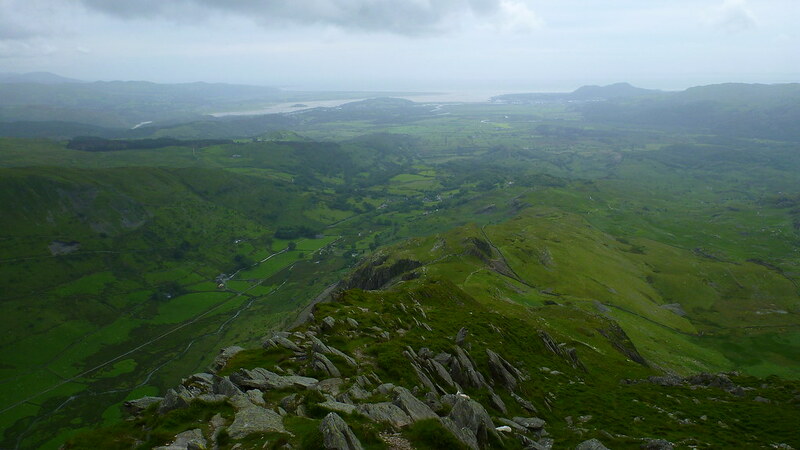 We decided to make a round trip by traversing Cnicht, a proper mountain by any definition. 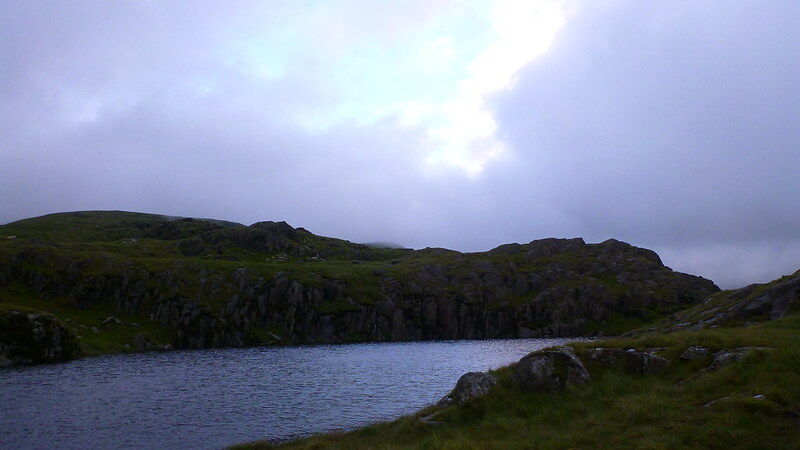 From our campsite it was an easy gentle climb past the lakes onto the NE ridge. 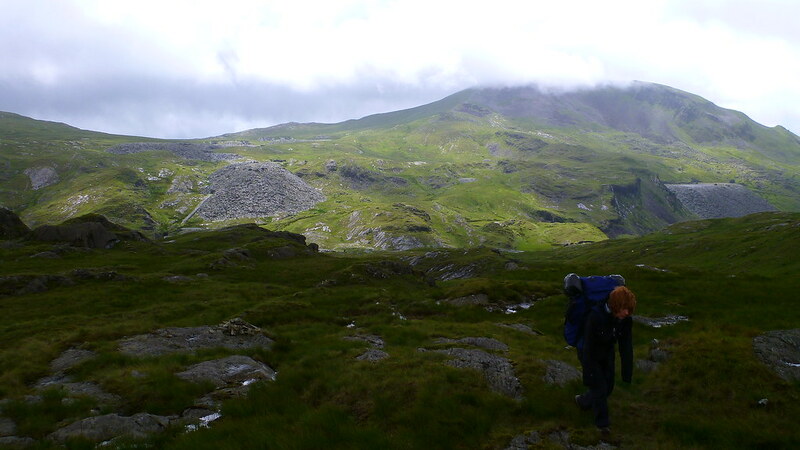 Even Snowdon was out of the cloud which pleased D although he was finding the rucksack a bit tiresome (he was actually coming down with a virus which laid him low for the rest of the week). 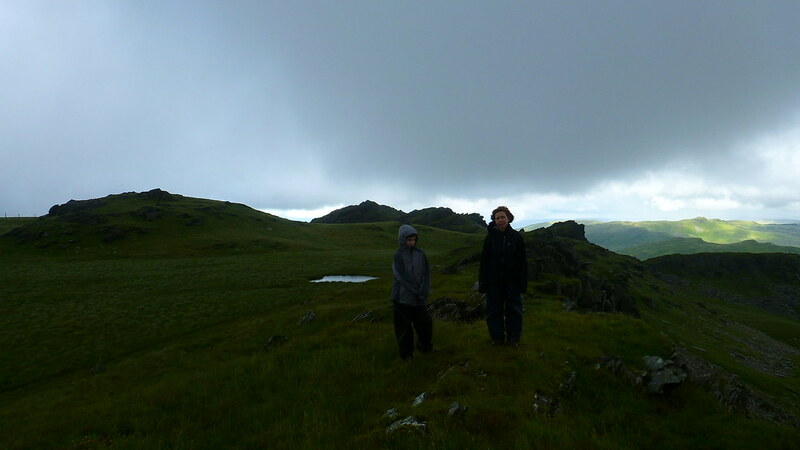 The stroll to the top was pleasant but windy although we did manage to find a sheltered spot on the summit for lunch and a brew. D was quite proud that he’d backpacked over a mountain and it was fitting finale to what had turned out to be a cracking weekend. Truly making the best of a bad weather lot. Had we been at home we’d probably just have festered in front of the TV all weekend, instead here we were closing out an exciting little mountain adventure. 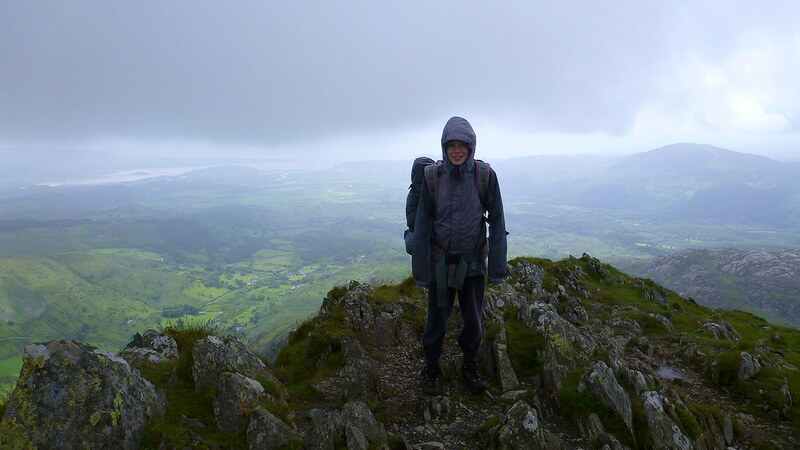 All that remained was the steep descent of Cnichts fine SW ridge in a blustery gale and we finished the whole day without any further rain. Not without further incident mind as I slipped off the last stile and gave myself a couple of nasty hand sized bruises on both my inner thighs. While Jane and the kids were away I cheered myself up on a dreary wet afternoon by treating myself through retail therapy and bought myself a dry-suit for my kayaking adventures. For the uninitiated it’s a total immersion suit that you put on over the top of normal clothing to eliminate the problem of stripping off a cold wet-suit exposed to the elements, easily the worst aspect of British watersports especially in the winter. I tried on a couple but the majority have a zip that runs across your back which is pretty hard do up on your own. I eventually chose a Palm Cascade as it has a zip across the front and was as easy to put on as these things are i.e. not very! I bought it mainly for winter gear when a wet change is pretty unpleasant. 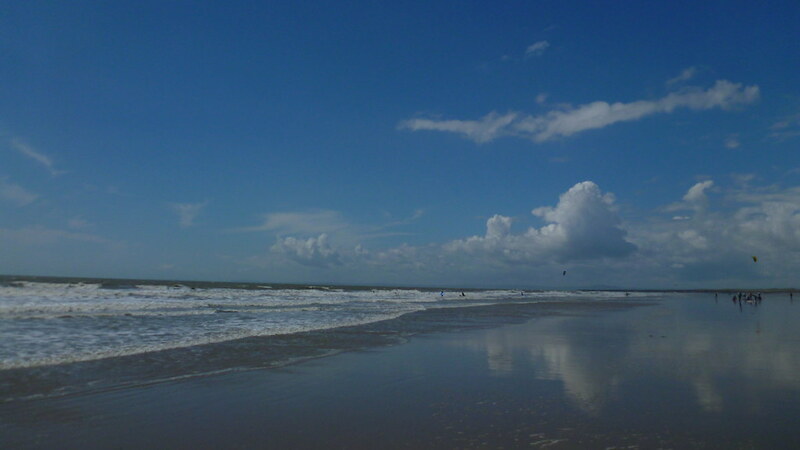 Seeing as the weather was pretty wintry anyway I thought I’d head down to the beach to try it out. 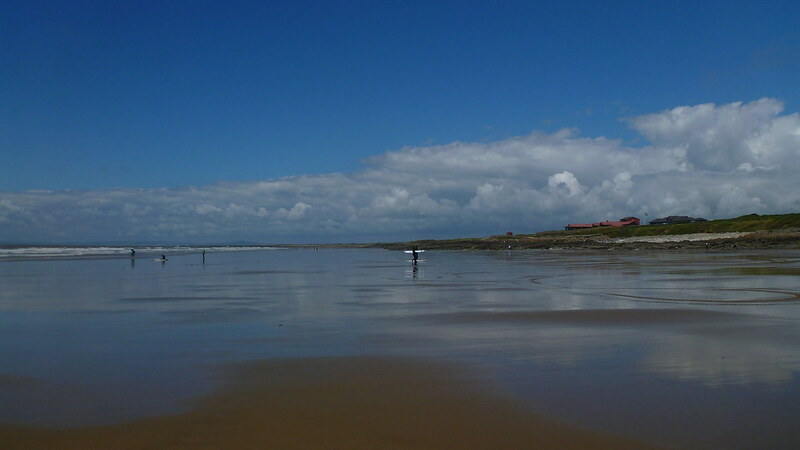 Rest Bay is about the nearest bit of coast to where I live and I can be parked up in about 1.5 hours from home. 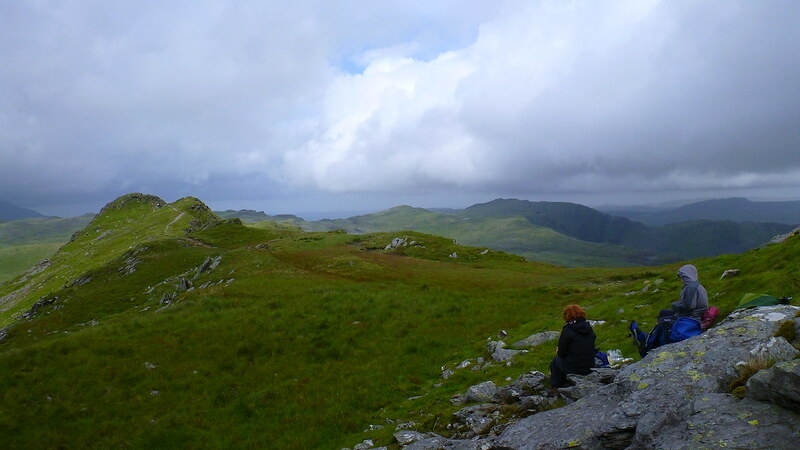 When I left and most of the way down it was pishing with rain but when I got there, it was blue skies all the way. It’s a pretty nice spot with a broad strand of sand (well mud/sand anyway) backed by low limestone cliffs. 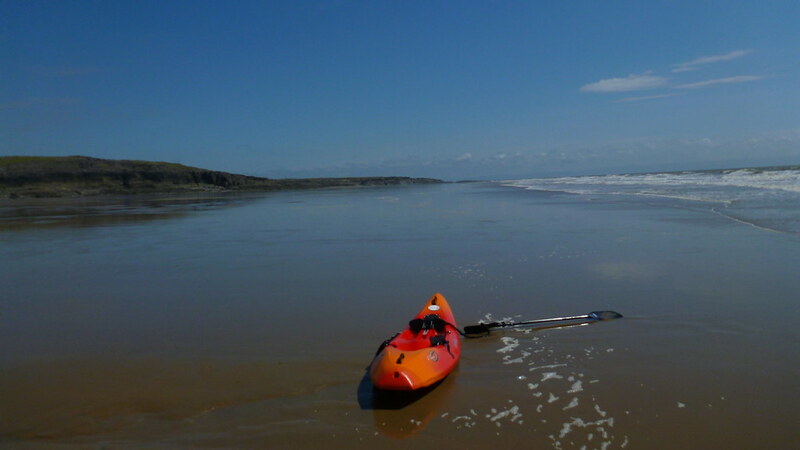 The views are unusual in that there is vista all the way across the Bristol Channel to the Gower and eventually to…. Port Talbot Steelworks! 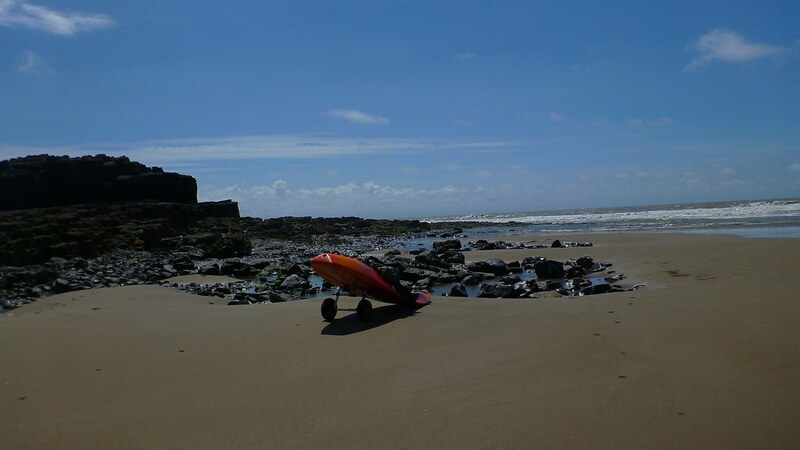 Still the grassland above the cliffs is very pleasant and the nearest town, Porthcawl, has been done up very nicely. As the beach is very fine sand/mud, when it’s choppy like it was today the water looks disconcertingly brown and mucky. 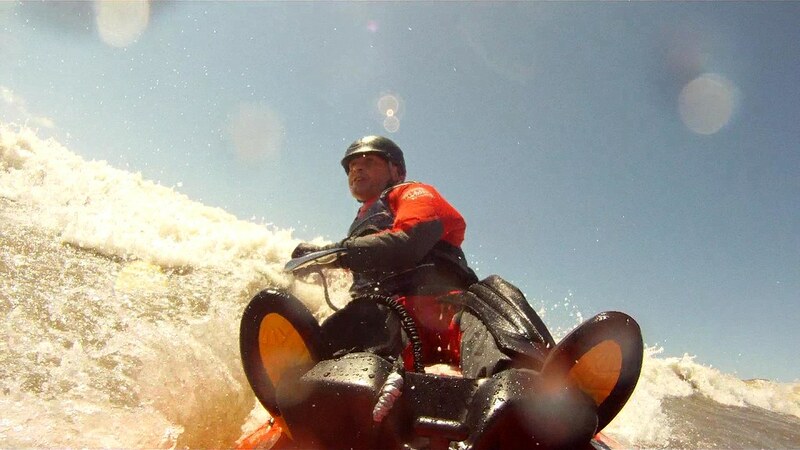 Still can’t waste good waves so I pulled on my new dry-suit over the clothes I drove down in and went in. The waves were very broken and choppy which isn’t always great for surfing and bloody hard to paddle past the breaking waves. However I got some surprisingly good, long and steep rides made all the more enjoyable by the warm and unexpected sunshine. 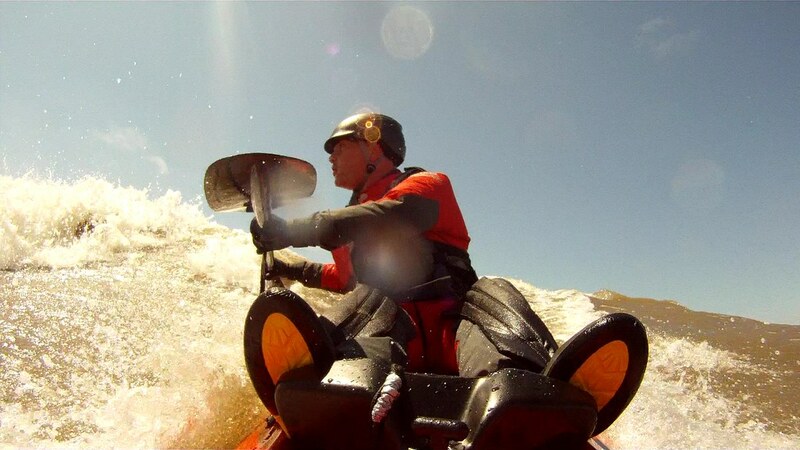 It felt very odd in the dry-suit as opposed to the wetsuit I normally wear, much colder without the neoprene insulation that the wetsuit provides. Strangest thing is that when you capsize the air trapped inside becomes buoyant and the whole suit floats on the surface. Must look pretty comical! After 3 hours of hard work and high quality fun and thrills, I called it a day and went back to the car to see how “dry” I was. Amazingly, the thing works. I had on my fleece suit I use when winter skiing which along with my socks was bone dry. Only problem was obvious, in warm sunshine you sweat and in a total immersion suit there is nowhere for that sweat to go. 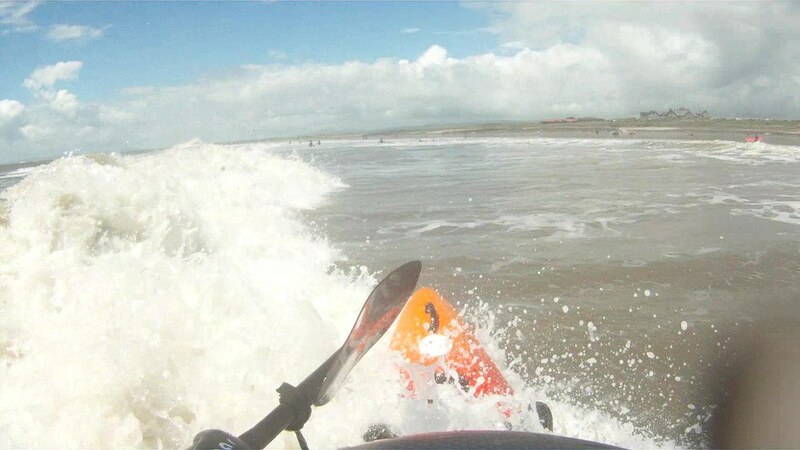 The cotton T-shirt I had on was damp but it definitely wasn’t salt water so the suit had done its job. I’d need something that doesn’t soak up the sweat to become damp and clammy in future. Well pleased with the new gear option but definitely an for winter rather than a shock, warm sunny summer afternoon – still a wetsuit for those conditions. A brief catch-up post from a couple of weeks back. 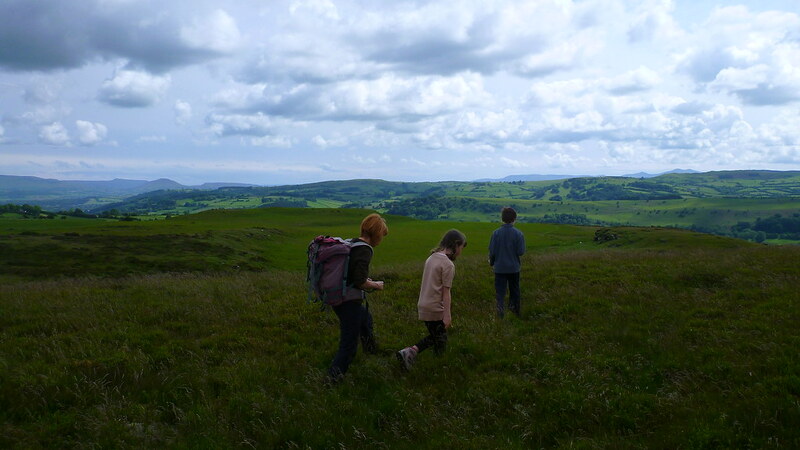 I had grand plans to get the kids out walking some of the smaller hills I’ve discovered and picnics in the sunshine. The never ending monsoon that is our current summer has put paid to that. 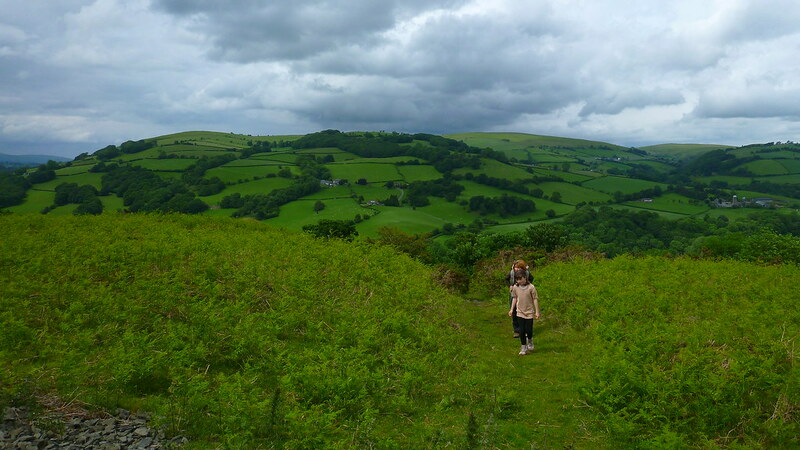 We decided to head out to Aberedw where I’d taken in a decent walk a few weeks back. 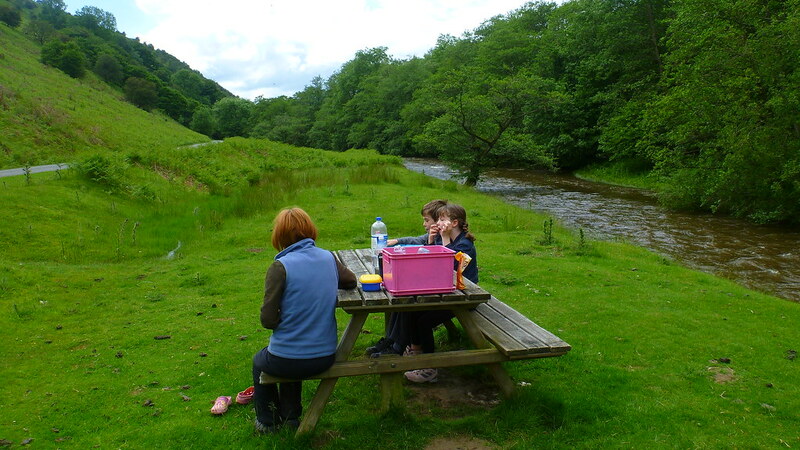 I’d found a lovely quiet picnic spot by the river so we headed there first for a spot of lunch. The weather was as it has been of late, sunshine and heavy showers, but we got lucky and had some nice bright weather while we ate and drank our lunchtime cuppa. 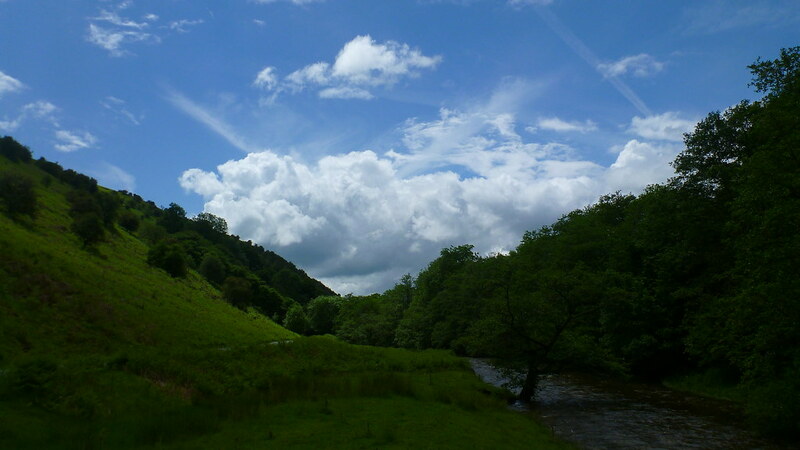 It would be a splendid place to relax and play in the stream but the river was far too high to go anywhere near the water so we contented ourselves with a play on the grass and a bit of fun trying to keep the sheep out of the back of the car. After lunch I took everyone for stroll up across Aberedw Common. 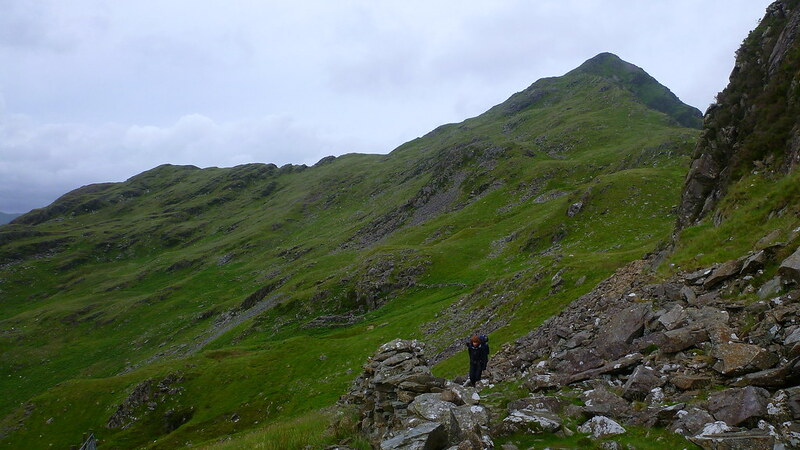 It’s a very pleasent stroll along green paths, past farm ruins, small tarns and low edges. 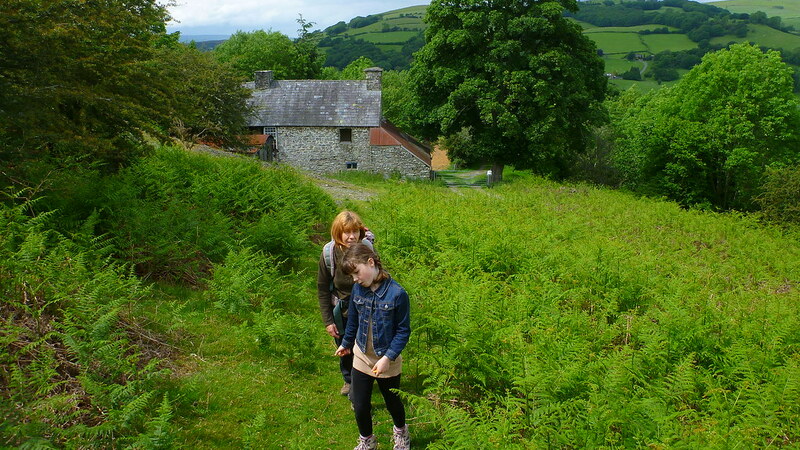 Ideal for the kids, not too much uphill and lots ofd splendid views across to the mid-Wales hills and south to the Brecons and the Black Mountains. Another to add to the “great places for a warm summer stroll and relax” if we ever get a summer. We were able to wander at a leisurely pace and talk, nice and laid back. All over a little quickly but when the weather is so wretched you don’t want to push your luck and get caught out with a soaking. Satisfied with our little excursion and some fresh air we headed home. It was our last day all together and at last the British summer delivered a day worthy of the name. Not exactly wall to wall sunshine but bright and most importantly dry. 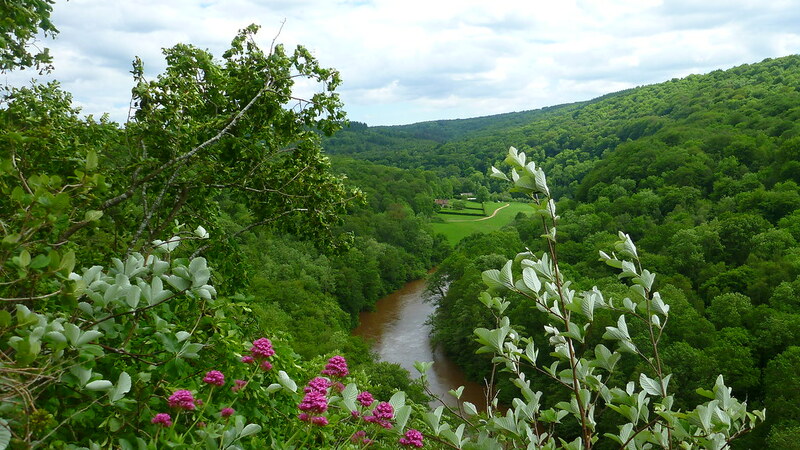 The weather was still too unpredictable to head into the mountains so I suggested another walk along the Wye Valley. 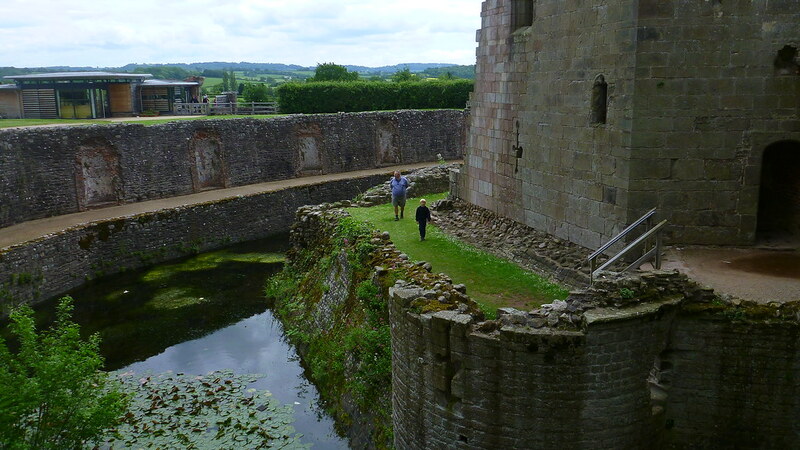 We needed somewhere for the kids to let off some steam so we headed for another of our local castles at Raglan. 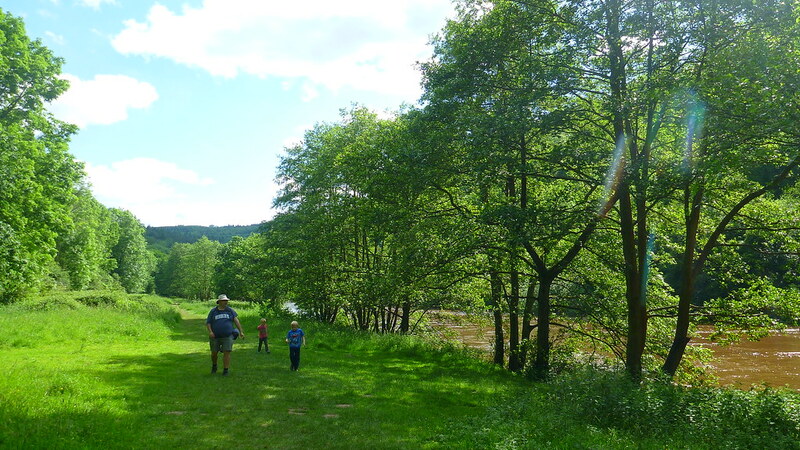 It’s not quite as evocative or atmospheric as the riverside setting at Goodrich but it’s much bigger and has loads more in the way of tunnels, rooms and stairways to explore so we just let the kids run riot and we all headed off to explore at our own leisure. 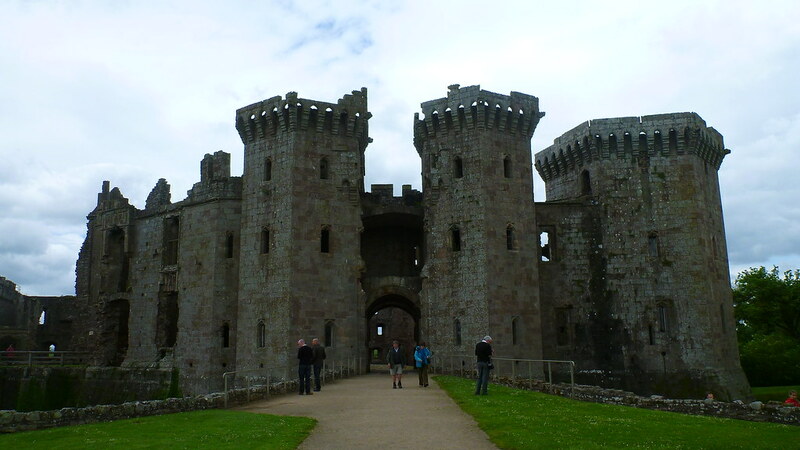 It has the classic castle features of a proper keep with a spiral staircase and a moat as well as dungeons. The kids were in seventh heaven and seemed to enjoy the extra space that Raglan has. 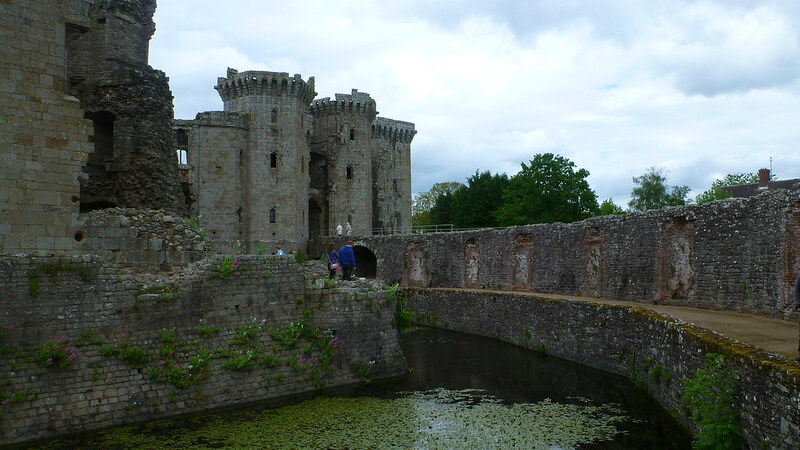 From my perspective it’s more fortified manor house than military installation with the decorative features and the moat designed to enhance rather than defend. It’s also less well presented than Goodrich with only sporadic information boards and no audio guide. 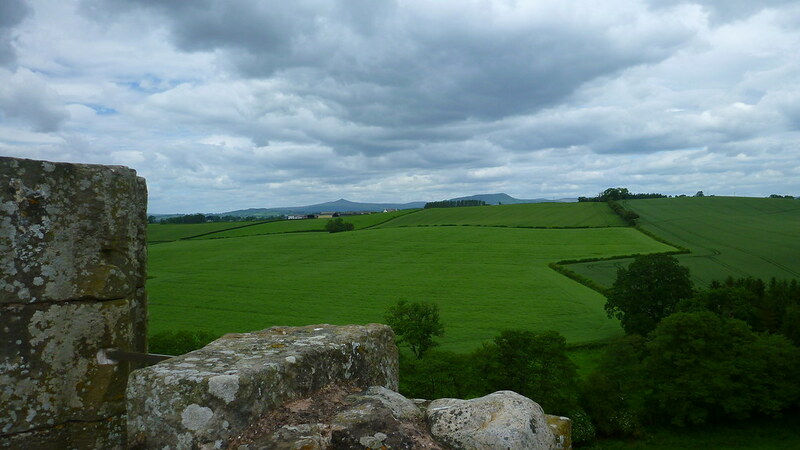 Still the views from the battlements were excellent and a fine time was had by all. 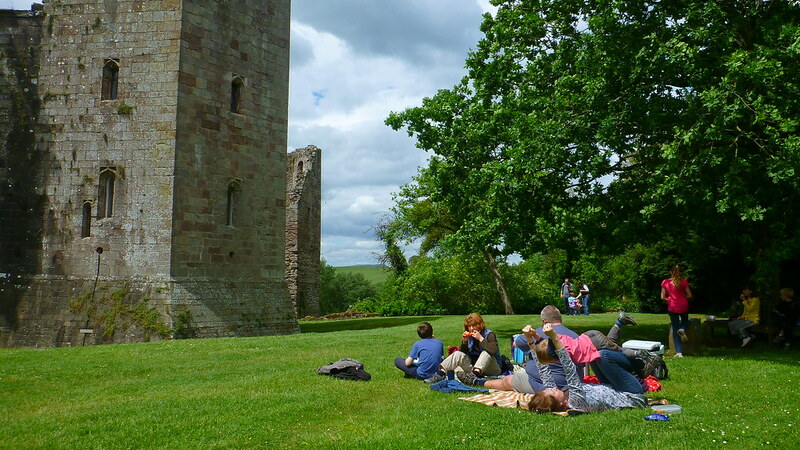 We decided a picnic in the grounds was in order and shock/horror the sun came out and it was almost hot! The adults lazed in the sun while the kids collected grass and mud-stains rolling around in the dry moat. You can read Mark’s post about the castle here. I would have happily stayed all afternoon but there was a walk in the offing. 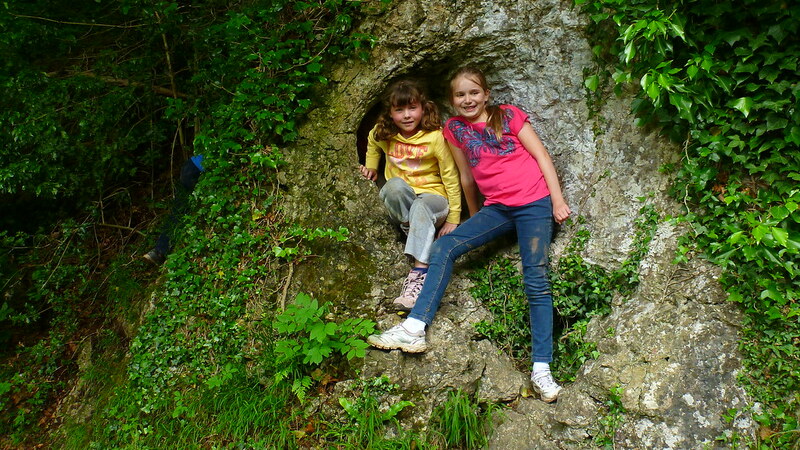 We collected the school party and drove a few miles up the A40 to take in a walk around some of the interesting stuff that surrounds Symonds Yat. First are the caves culminating in King Arthur’s Cave (he gets about this bloke, caves, seats and castles all over the place). The kids of course thought these were great fun especially the small one they could all climb through. 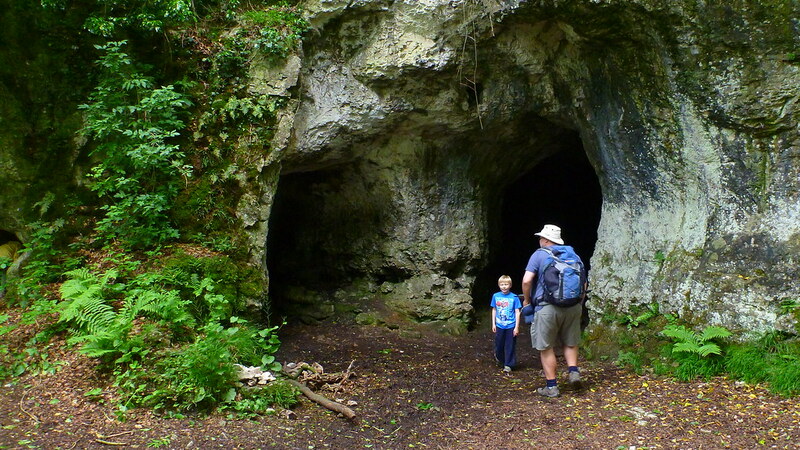 Not exactly a huge cave system but enough to entertain the kids and find a few calcite features and mud. 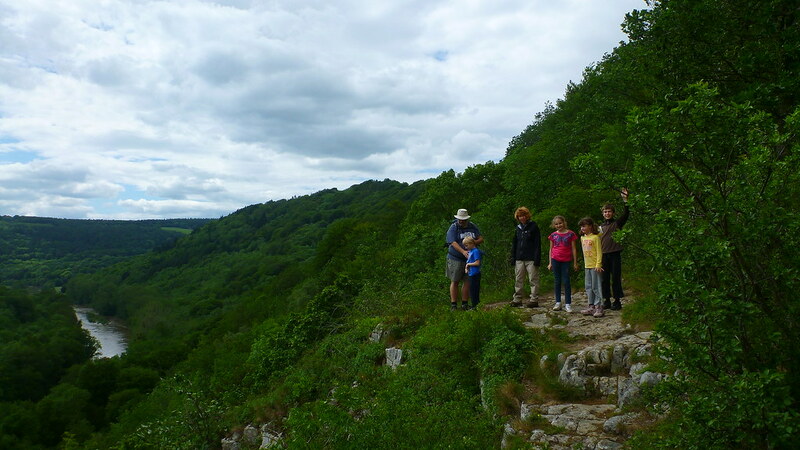 From there the walk takes you down towards the Wye, first taking in Seven Sisters Rocks perched high above the river. 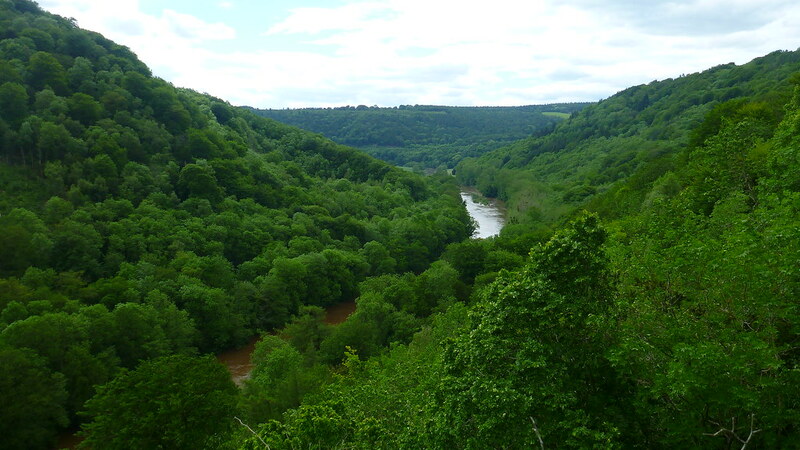 One of my favourite local spots with spectacular views along the gorge and down to the river of chocolate below. The usual nervous times for the parents with kids dashing about near the cliff edge! Onwards to the river and the Biblins campsite, reserved for school groups (bit of a shame for everyone else as it’s a nice spot). 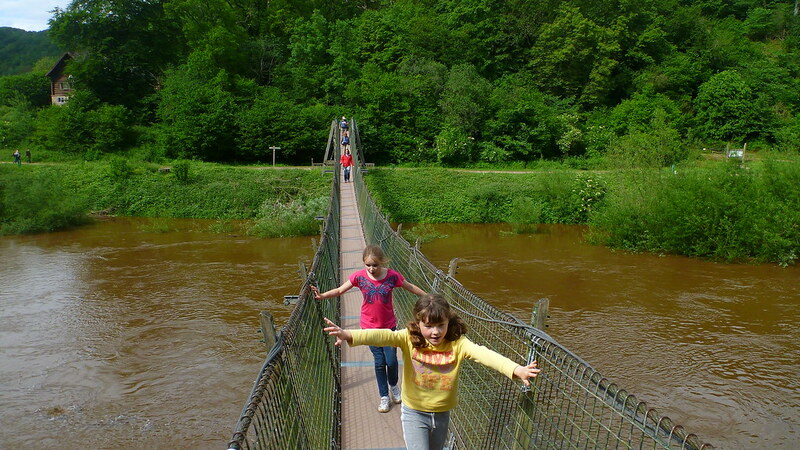 The river crossing is by a narrow suspension bridge which again the kids found mightily entertaining, enhanced by the fast flowing river beneath. 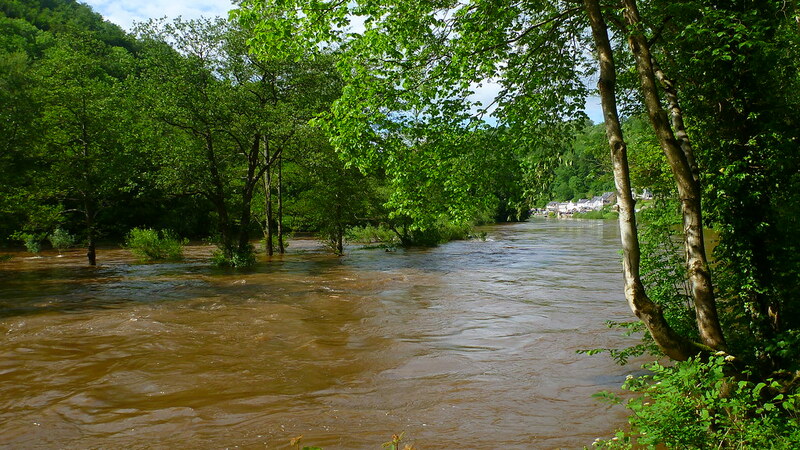 As we strolled up towards Symonds Yat the sun came out properly and treated us to some stunning vistas across the river complete with flooded islands and rafts of debris floating downstream after the Monsoons of the past couple of days. The last day was turning into a great one and everyone enjoyed the pleasure of walking at a steady pace in the warm sunshine, drinking in the riverside views. 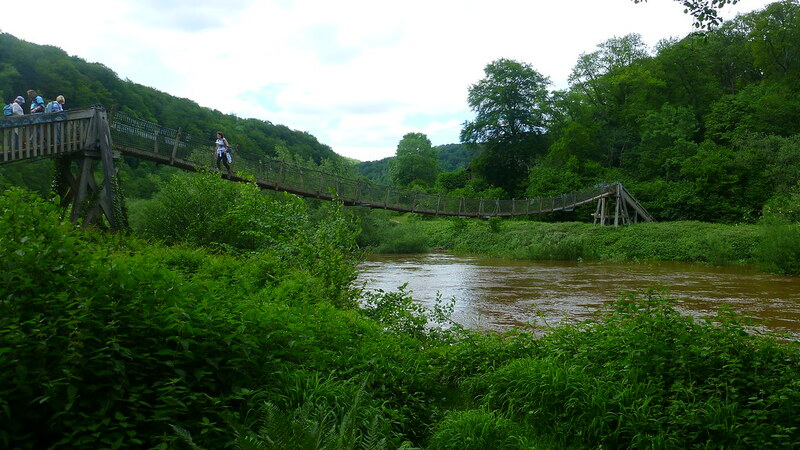 We had planned to use the small ferry that crosses the Wye and return to the cars by some more caves. 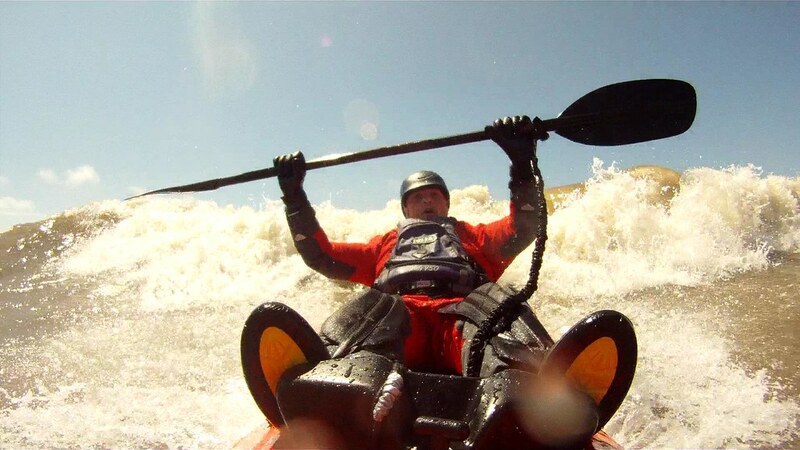 Unsurprisingly, it wasn’t running due to the sheer volume of water and huge amounts of flood debris. The kids were placated with the promise of ice creams while Mark and me walked back the way we’d come to collect the cars and pick everyone up for the journey home. Mark’s take on the day is here.